Fire Ants live in the southern and southwestern regions of North America. They are very hardy, being able to live in nearly any environment, and eat nearly anything that could possibly be edible. 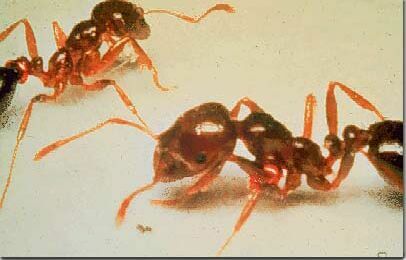 These ants are seen as beneficial to some people, because they are predators of many insect pests. However, others find these insects devastating because they often damage young plants. They sting AND bite, producing a burning sensation like fire, hence the name Fire Ant.